A look at the sport of swimming in the Turks & Caicos Islands. When a slave ship wrecked off the coast of Martinique in 1679, one of the Africans, whose name has been lost to history, managed to escape the sinking vessel. He swam for 60 long hours before reaching shore — an astounding feat not duplicated by anyone for 300 years. The accomplishment is made even more incredible because he did it without a support boat guiding him, no regular rehydration or feedings along the way, and much of it at night in choppy, predatory waters. Slaveholders quickly recognized the unique aquatic capabilities of newly arrived slaves in the Caribbean and regularly used them to dive for pearls and recover treasure from shipwrecks. Indeed, the Europeans, and later, Americans, were so impressed that they sometimes had slaves teach them and their children how to swim properly and efficiently, a skill that had eluded them since medieval times. In a tragic irony of history, the ability to swim by people of African descent was lost over time in the West Indies with a few notable exceptions, such as lobster and sponge divers in the Turks & Caicos and elsewhere. Still, while many visitors to these Islands joyfully plunge into the clear turquoise water and glide with confidence without a second thought, for far too many residents the ocean has become something to avoid. 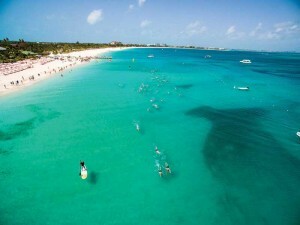 Grace Bay is the setting for the annual “Race for the Conch” Eco-SeaSwim. In fact, it has become a cliché to express amazement that so many people living on islands surrounded by water can’t swim. While to a degree true and unacceptable, there is nothing to be gained by dwelling on the idea. Instead, why not reverse history and reinvent the culture of swimming? • Since 2012, Caicu Naniki Sports Adventures (founded by Ben Stubenberg and Chloe Zimmermann) has been teaching youngsters at the Provo Children’s Home on Saturdays how to swim and survive. • Since 2013, SURFside Ocean Academy (founded by Morgan Luker) has been working with the Edward Gartland Youth Center to give swim lessons to some 40 teens a year. Many of the students repeat the 10 session program and have become proficient swimmers. • Since 2013, FB Total Adventure (founded by Jill Swann) has been working with Extraordinary Minds to teach autistic kids the basics of swimming, along with teaching very young children water safety. • In 2014, the Turks & Caicos Islands Swim Federation designed and implemented a Swim & Survive program to help prevent drownings for Raymond Gardiner High School in North Caicos, per request from Vice Principal Tony Hislop. With financial assistance from David and Elizabeth Stone, 3 TCI Swim Federation members responded with four sessions that taught 38 students and 8 teachers to swim at Sandy Point. 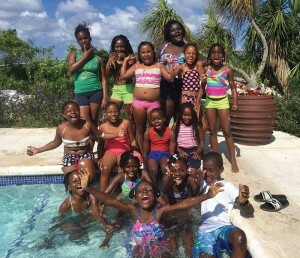 • In 2015, the TCI Red Cross began to incorporate a short learn-to-swim program for 15 summer campers in the ocean and the pool. The campers got a special treat when the TCI Swim Federation arranged for three-time Olympic Gold Medal winner Rowdy Gaines to join the local volunteer swim teachers to give them a swim lesson. • For the past 10 years, the annual Commonwealth Beach Games held on Governor’s Beach in Grand Turk always incorporates a learn-to-swim element using local swim teachers, most recently from SURFside and Caicu Naniki. • For many summers now, the Department of Environment and Coastal Resources (DECR) has incorporated a learn-to-swim program for its Junior Park Wardens using Provo swim teachers. Last year, DECR teamed up with Provo swim schools and Tina Randall to highlight World Oceans Day by offering free swim lessons at the Bight Children’s Park. Primary school students enjoy a swim lesson. This year, Caicu Naniki, SURFside, and Waterplay are teaming up with donors on a new initiative to work directly with selected schools to teach swimming and expand the numbers even more. The pilot program will begin with a six week swim program for youngsters aged 12 and 13 at no charge. The International School in Leeward, Providenciales opened this spring a 20-yard pool that will also be made available for use by swim clubs to teach youngsters, as well as International School students. As with many athletic endeavors, it is crucial that youngsters and adults learn to swim correctly from the beginning and not fall into bad habits that have to be unlearned later. Swimming is a technical, thinking person’s sport, and so it is essential to emphasize relaxation and the need to focus on each motion and body part correctly — head position, hand placement, the “catch,” the pull, arm recovery, hip rotation, and kick, among others. The goal is to minimise drag and streamline the body. To get it right requires swim teachers with skills and experience to take students through a step-by-step process appropriate to the age and water comfort level of the swimmer. Complementing these learn-to-swim initiatives are three annual open water swim races in Grace Bay for youngsters and adults to set goals and have an opportunity to achieve them in a benign but competitive environment. All races give proceeds to promote swimming and other local causes. Pushing the limits is an up and coming event called the “Caicos Cays Turquoise Water Swim,” an eight mile relay event made up of four-person teams swimming from Pine Cay to Grace Bay. The swim would follow the same route along the Caicos Cays as marathon swimmer Yuko Matsuzaki’s historic non-stop swims from Sandy Point, North Caicos to Grace Bay in 2014 and 2015. Other popular fun and competitive island sporting events such as Windvibes and the TCI Triathlon include swim race segments that also allow for more swim practice and experience in friendly, well managed venues in Long Bay and Grace Bay. As significant as these goals and activities are, there is a big hurdle: No proper competitive pool. Most swim lessons take place in the ocean, but that is limited to calm days and lacks the element of a controlled environment that greatly facilitates learning. Fortunately, some resorts and local businesses have generously allowed limited use of their pools at no charge or for a modest fee. These include pools at the Alexandra Resort, Grace Bay Club, Flamingo Divers, Wrightfully Fit, the Zanzi Bar, and as noted, the International School. But the demand is greater than the resources. Deputy Premier and Minister for Education, Youth, Sports, and Library Services Hon. Akierra Missick and the TCI Swim Federation have been the leading advocates for building proper learning, training and competition pools to international standards. Fortunately, TCI has the local expertise to design and build pools to such standards. Some of the designers and builders have already volunteered their expertise to ensure top quality at the best price. Change is in the air and, more importantly, in the water. The interest and demand is there. Parents want their kids to swim. More than a sport, it’s a life skill that not only can save a life, but lead to other water-based careers where the ability to swim is essential. No question — swimming is something every resident should do as part of being a Turks & Caicos Islander. Make it part of the culture again because that’s who we are. Over time, natural talent will rise from more youngsters in the water learning to swim, and the Turks & Caicos could see outstanding competitive swimmers able to race on the world stage. A start has been made: After a 12 year hiatus, TCI sent its first swimmer, Laura Shaw, to compete in the 2015 CARIFTA Games. When one looks at other West Indian islands that have built proper training pools, the ability to swim and swim competitively has dramatically increased to a world class level. That can happen here too. History doesn’t have to be static or lock anyone into a mindset. There is still much to do, but everyone is united in making not being able to swim a thing of the past. Ben Stubenberg, is president of the Turks & Caicos Islands Swim Federation and Co-Founder/Chief Swim Instructor at Caicu Naniki Sports Adventures. He can be contacted at info@caicunaniki.com or tciswim@yahoo.com.